After breakfast at Twig's, another docker, Al, was loading up his 16 ft cuddy cabin cruiser he built from a plan in a 1958 Mechanics Illustrated magazine. Al took 14 years to complete the boat. A friend hand carved the wooden steering wheel. When the friend died a couple of years ago the wheel was at the funeral and now has a memorial plaque on it. The boat has a galley with fridge and running water as well as a head. (see photo). 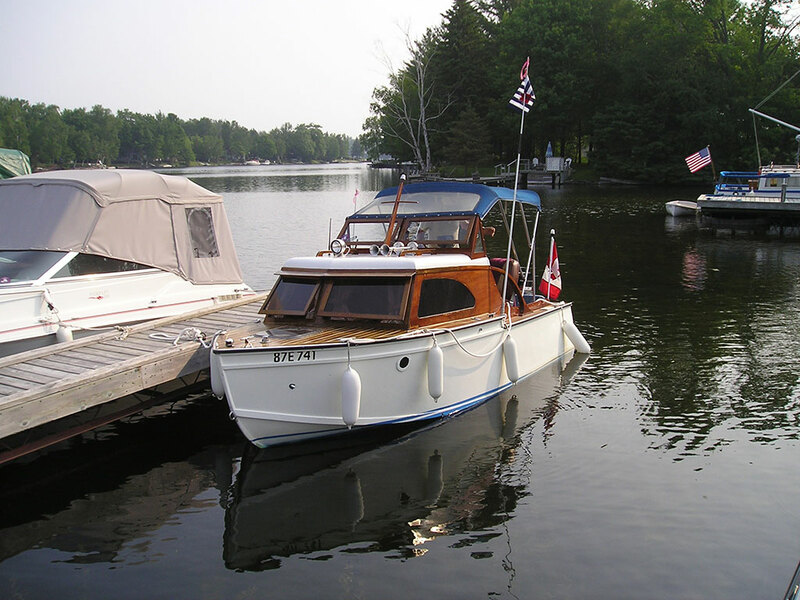 At 11:30 we left in Don's Grevette wooden runabout for Kirkfield. It was fun to be on the water doing 50 mph covering in minutes the same stretch in which we spent 3 hours 1.5 weeks ago. The milk shakes and hamburgers at Lock's Nest Restaurant were really good. This afternoon it looked like we would get a thunderstorm but it petered out with only a sprinkling. I am hoping for a good rain that will wash the dust from the road off the boat.